It’s not as glamorous as running (I’ve always wanted to be a runner but am definitely not one. I am simply a very good walker). 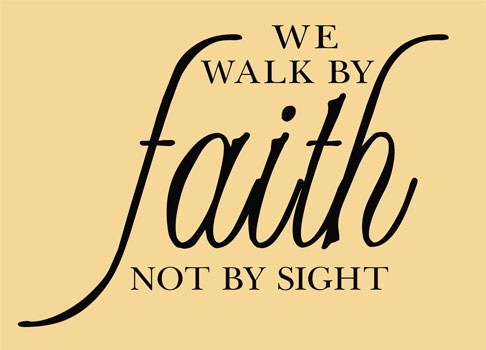 The real work isn’t using your gifts by faith but living your life by it…walking by faith. Paying your bills, doing your job, cooking dinner, cleaning the toilet by faith. acknowledging that God’s power is revealed not just in the great but in the small. Not just in the extraordinary but in the absolute ordinary. It is when God’s grace and power is evident in washing the dishes, which for some may be easy but for others it is an arduous and overwhelming task when you are tired and spent. It is when you stop yourself from going all buck wild on the attitude you just received from your teenager and pray for wisdom instead of retribution to be rained drown on their heads. It is when Christmas isn’t working out to be what you hoped for but you are able to roll with the punches and still enjoy the special moments that would otherwise be buried in resentment and disappointment. When what you see does not dictate how you behave, in small dull moments as well as big exciting ones. Yes, it isn’t very exciting but it is totally life giving. May you walk slowly, steadily and consistently in faith in who Jesus is, what he has done and in who he is re-creating you to be.